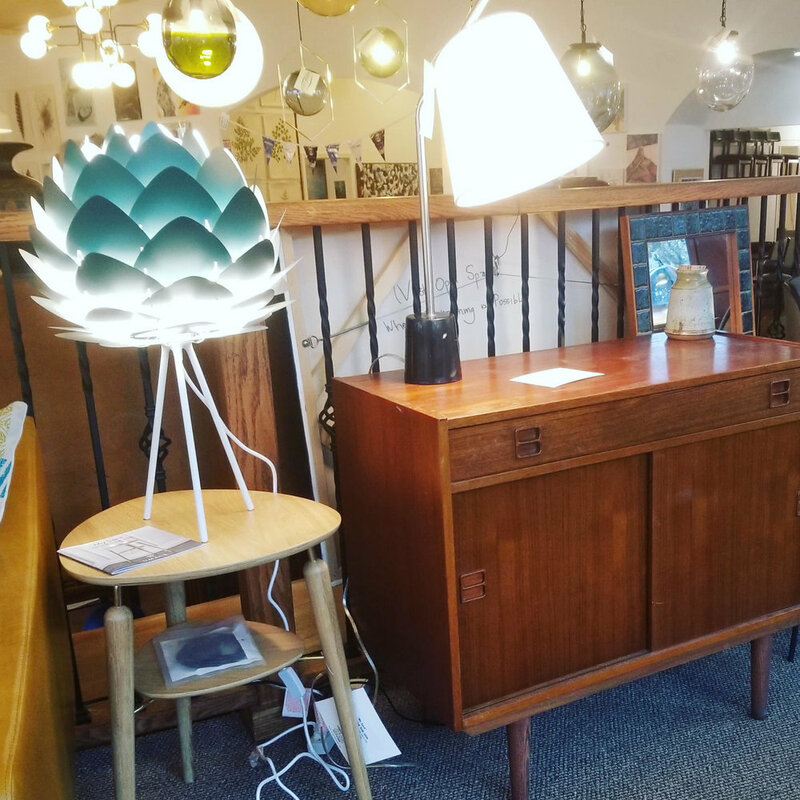 20% Off Mid-Century Modern Furniture! COME SAVE DURING OUR SPRING CLEARANCE SALE! 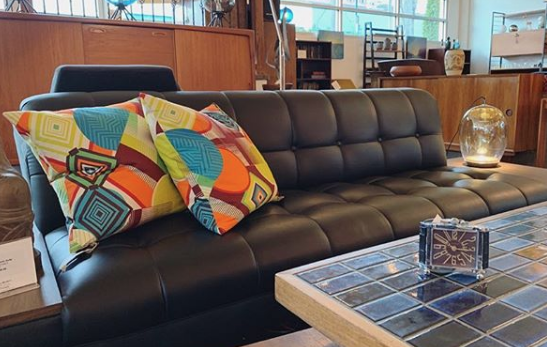 Whether you’re looking for a stylish dining set or searching for the perfect coffee table or sofa to complete your living room, you’ll save 20% on our entire collection of one-of-a-kind Mid-Century Modern furnishings through the end of April! This 1950’s Danish rosewood dining table features pullout extensions and is waiting to host your dinner guests or weekend brunch! The beauty is in the details! 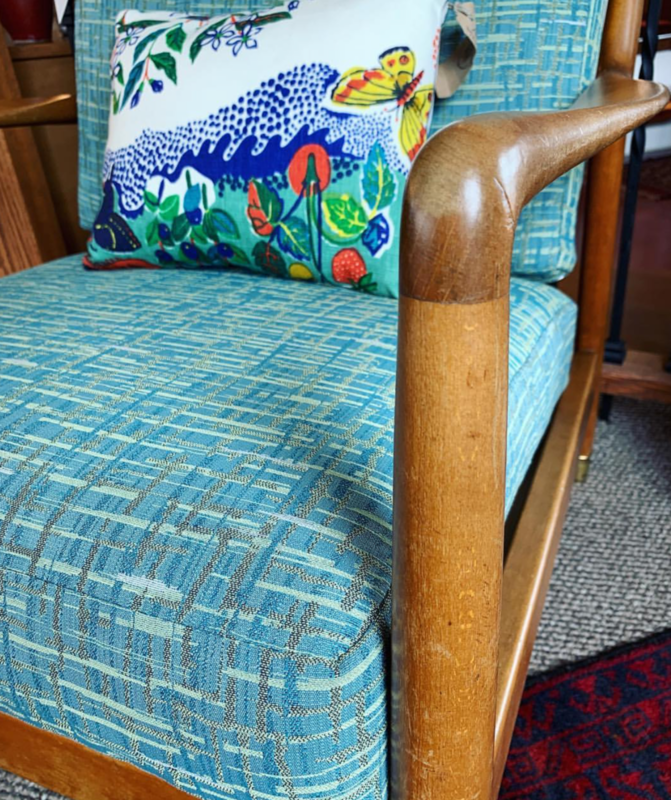 This vintage Folke Ohlsson lounge chair is crafted from beautiful rosewood and the turquoise fabric is flecked with gold tones. A true work of art and craftsmanship. And if you just need a bit of extra storage in your living or bedroom, this 1960’s Danish side table is a useful and stylish option. It features a shelf for magazines, books and remote controls as well as a pullout drawer. So come in and save 20% on all MCM furnishings through April 30! Spring Cleaning? We've Got Storage Solutions! It seems warmer weather is finally arriving in Portland, and for many of us that means SPRING CLEANING! Having the right storage solutions helps keep your home free of clutter, and we have a variety of beautiful vintage options in stock. This vintage Danish 2-piece secretary desk and bookcase is crafted from solid teak and offers a plethora of storage. Aside from its slide-out desktop, it has plenty of slots for organizing bills, magazines and paperwork and 7 sliding compartments ideal for storing office and school supplies. It also features roomy storage drawers underneath as well as a 3-shelf cabinet bookcase. We also have a variety of bookcases, shelving and storage cabinets to suit any home decor! We love this vintage rosewood wall-to-wall shelving! This gorgeous unit features two lit displays and is perfect for showing off your book collection, pottery and favorite finds. So if you’re looking to cut down on clutter and organize your home this spring, come browse our showroom! We’d love the opportunity to help you find the perfect piece to add beauty and functionality to your home. Shop our Pop Up Boutique at Urbanite! Looking for something fun to do this weekend? 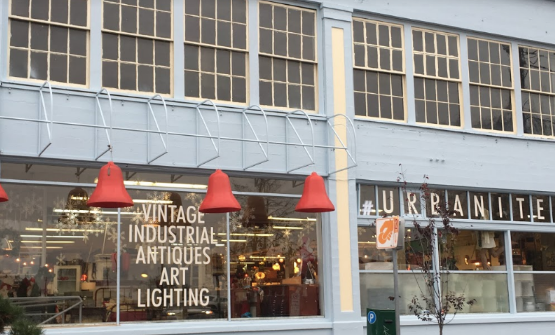 Head over to Urbanite to browse our Legacy Modern pop up shop as well as 40 other vendors selling antiques, vintage furniture, salvage finds, artwork, lighting and more under one roof! 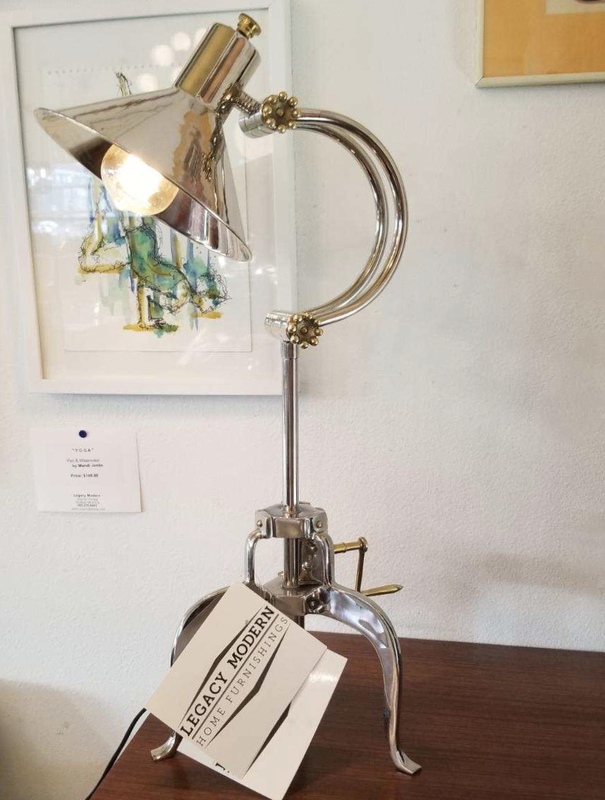 We have a beautiful selection of vintage, industrial and new furniture, lighting and home accents on display in our spacious Urbanite boutique! You’re going to love the A Conversation Piece lounge chair from UMAGE (pictured below), which blends form and function to create a stylish and comfortable seating option for your reading nook or living space. Our collection also features beautiful vintage dining chairs, new lighting, home accents and more. So come by Urbanite this weekend to shop the Legacy Modern collection! Urbanite is located at 1005 SE Grand in Portland and is open every day from 9am - 6pm. For more information, visit the Urbanite website. Save Big During Our Winter Sale! Time to freshen up your home decor? Stop by our showroom on the corner of 7th & Clay to save some green during our Winter Sale through March 10! Save 20% on all vintage furniture, from Arts & Crafts to Mid-Century Modern. You’ll also save 20% off all STUDIO TULLIA accent pillows! Plus, new lighting, sofas and chairs are 10-15% off. This includes pieces from One For Victory, Umage Design, Casamotion, Viz Art Glass and more. If you’ve ever been in our showroom, you’ve likely noticed all the colorful and unique pillows we carry in stock. These are the work of STUDIO TULLIA, a bespoke workroom for designer soft goods, storied textiles, art and vintage finds. Every accent pillow is designed and handmade in Portland, OR by founder Suzanne and her team of specialized and skilled artisans. All STUDIO TULLIA pillows are 20% off during our Winter Sale, so we thought it was the perfect time to introduce this beautiful, one-of-kind collection! These fun Studio Tullia designs infuse a fresh pop of color into your home decor. The unique handcrafted collection also includes classic prints such as plaids and stripes. Stop by the store to save 20% off the entire STUDIO TULLIA collection! We’re in love with the new arrivals to our showroom! This black vintage platform sofa is 108” long and adds major style to your living space! Meanwhile, this beautiful vintage Danish brown leather sofa pairs nicely with our vintage Danish rosewood coffee table. The table features drop-down sides and a handy wicker shelf for storing magazines, books and remotes. Come in and browse our new collection of vintage sofas and coffee tables, and save 25% off all Studio Tullia throw pillows through Jan 31! 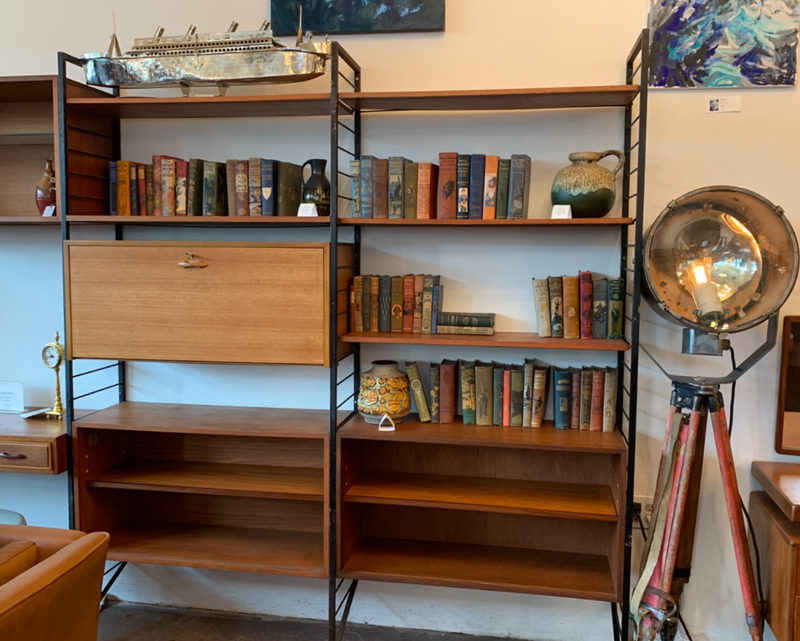 If reading more books is on your new year’s resolution list, we have some beautiful new bookcases in stock that will inspire your book collection! The perfect bookcase for small spaces, with extra storage in the cabinets below. 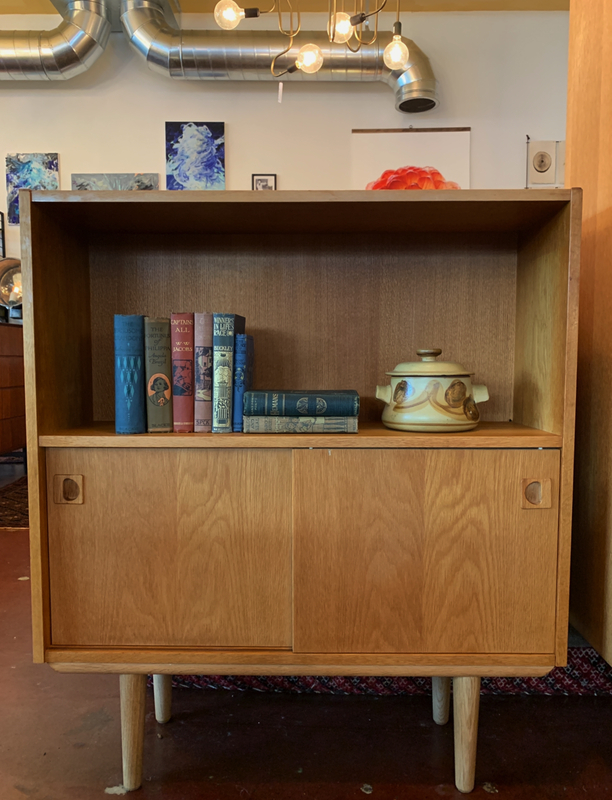 We love this 1960’s Danish oak bookcase with adjustable shelving. We even have wall-to-wall book shelving that makes a powerful statement in any room! And if you’d like to fill those shelves with a unique book collection, we have more than 300 volumes in stock, from interior design and architectural books to classics like King Solomon’s Mines and The Adventures of Robinson Crusoe. This Taschen book series on the decorative arts is a must-have for any design lover and book collector! We are completely enthralled with our newest lighting collection from Viz Art Glass. Here’s a sneak peek of what you’ll find new in our showroom! EACH VIZ ART GLASS PIECE IS HAND BLOWN AND FUSED WITH PRECISION BY TALENTED ARTISANS. NO TWO ARE EVER ALIKE. EACH PIECE IS A UNIQUE WORK OF ART. THIS UNIQUE LIGHTING CAPTURES BOTH LIGHT AND THE IMAGINATION. IT'S ABOUT CREATING A MOOD AND AN EMOTION. BY PLAYING WITH LIGHT, COLOR AND TEXTURE, THE VIZ ART GLASS COLLECTION TELLS A STORY THAT INSPIRES A STATEMENT FROM A FOUNDATION IN ART. WHAT UNIQUE STORY WILL YOU TELL IN YOUR HOME? 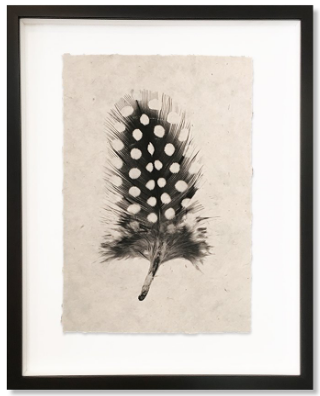 If you’re seeking to bring a touch of the outdoors in, then we’re excited to introduce you to our newest collection of fine art nature prints from Barloga Studios. Stunning fine art nature photography is printed in beautiful full color onto exquisite, handmade Nepalese paper, or on grand-format cotton rag. Both are an intriguing choice for those seeking a unique texture and look. Each sheet differs slightly in weight and color, ensuring that no two pieces are quite the same. The result? A truly one-of-a-kind art piece for your home. The collection ranges from ferns and florals and feathers to tree rings, nautical knots and fishing flies. The Grand Format pieces are printed onto a single sheet of cotton rag. Each piece measures 40"x60" and is available with either a natural or bright white background. Grand format prints are intended to be hung without a frame. These simple and elegant prints look incredible with Scandinavian-inspired decor as well as rustic or mid-century modern homes. 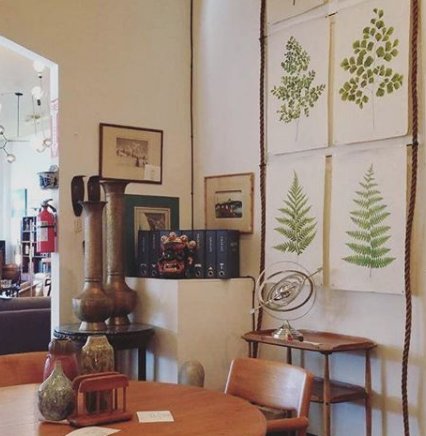 The fern prints as displayed in our showroom with rope and rod. Come browse the Barloga Studios collection at Legacy Modern and take home one of these extraordinary pieces to infuse your living space with creativity and natural beauty. We’ve just unloaded a truck of new inventory, and we’re excited to introduce some wonderful new home accents! New home accents available in store include this very rare collection of porcelain vases from Royal Copenhagen Baca by Nils Thorsson. The beautiful detail is something else... you have to see them up close and personal! We love these coordinating plant baskets and accent pillows from Studio Tullia! We have some beautiful new table lamps in store, including this gorgeous turquoise accent lamp from UMAGE. We even offer in-store assembly! Or, if you’re looking for a more classic style, what about these circa 1910 Arts & Crafts oak and glass table lamps with original finish? We also have a variety of pottery, vases, sculptures and accent pieces available, and they make great gifts! If you haven’t been into our showroom recently, you have to come browse our stylish new UMAGE collection! 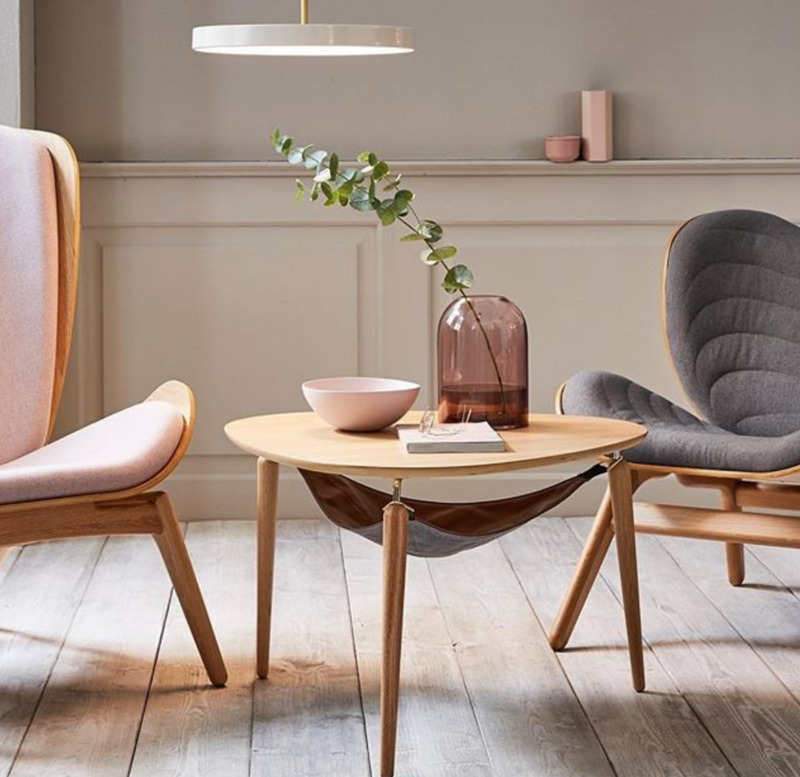 This new Scandinavian-inspired collection combines aesthetics, simplicity and functionality, with a focus on thoughtful craftsmanship and environmental care. The result is exquisite designs with a sustainable mission. The UMAGE Reader chair and Hang Out coffee table make a stylish and functional pairing. Now available in store! We are excited to now be carrying UMAGE seating, accent tables and lighting to bring beauty, comfort, style and functionality to your home. The UMAGE Hang Out Coffee Table is as functional as it is stylish. With its minimal and organic shape crafted from wood, fine metal and fabrics, the Hang Out coffee table has a classic Scandinavian expression. Slender legs attached to the curved table top give the Hang Out a light and airy profile. Underneath the table top, a special bag is suspended across three legs like a hammock. The stylish two-sided leather and textile bag is perfect for storing your remote controls, magazines, books and other small items. The Reader and A Conversation Piece armchairs add warmth, style and comfort to your living space, inviting conversation with friends or an evening with a good book. The Reader armchair has been designed as a space to relax with a good book and a cup of coffee. The armchair’s special curved shell is inspired by traditional Danish crafting techniques and helps to reduce surrounding noise, offering a place of shelter and reflection. With its light form and bold organic curves, The Reader is a standout design piece in any room. Meanwhile, A Conversation Piece is an armchair that encourages unwinding and having a conversation with friends. It is ideal for use in the living room, as a corner armchair or as part of an extra lounge area. Its comfortable shape also makes it suitable for the bedroom or as an extra armchair in a nursery. The armchair’s final look is extremely flexible as the interchangeable upholstery is easy to remove and update. We also have an array of UMAGE lighting, from table lamps to hanging pendants. We’ll even assemble them in store for you, ready to take home! Our right-hand man, Zuko, assembles a UMAGE lighting at the store. Shop Our Black Friday Weekend Sale! Give your home a holiday makeover! Come #shopsmall with us this weekend and save big on the ENTIRE SHOWROOM! We’re combining Black Friday and Small Business Saturday into a 3-day event, packed with great deals on everything from living, dining and bedroom pieces to gorgeous new lighting, accents and local art. #ShopSmall with us all weekend! Introducing Our New UMAGE Collection! Come fall in love with our beautiful new collection from UMAGE. 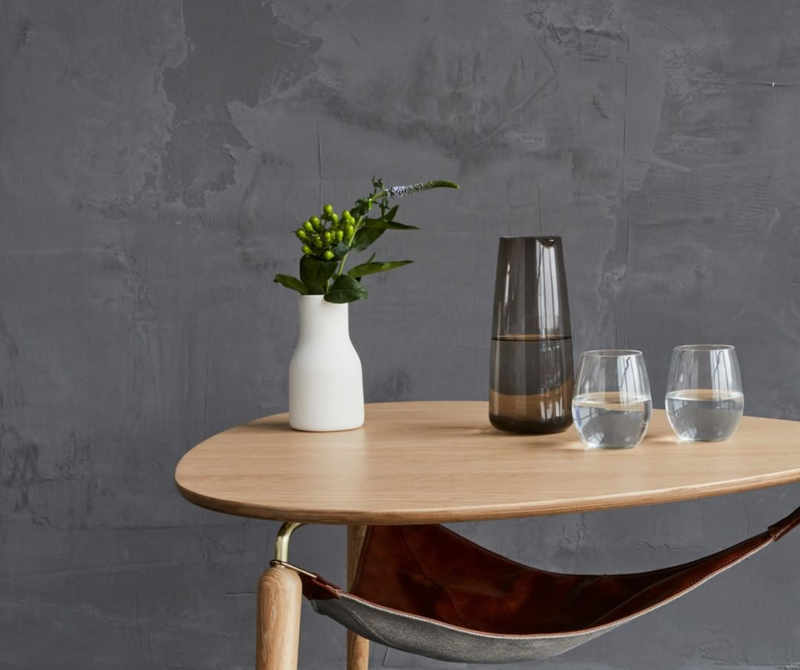 This new Scandinavian-inspired collection combines aesthetics, simplicity and functionality, with a focus on thoughtful craftsmanship and environmental care. The result is exquisite designs with a sustainable mission. We are thrilled to now be carrying the UMAGE line of seating, accent tables and lighting to bring beauty, comfort and functionality to your home. Shop Small & Save Big! Throughout Black Friday weekend, our entire showroom will be priced at least 10% off, with deeper discounts for specially marked pieces. You’ll save up to 20% on mid-century and vintage pieces, 50% on select floor model lighting and 15-20% on select sofas and seating! Now is a great time to shop for new dining, living or bedroom pieces before hosting holiday guests. 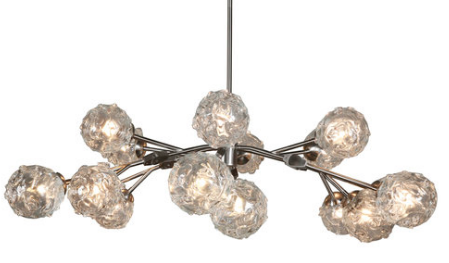 Come browse our beautiful new lighting from UMAGE, Casamotion & more, all on sale this weekend! Thanksgiving is less than a month away, and we’re here with 7 helpful tips for styling a festive dining table! 1. Start with the perfect table! Here at Legacy Modern, we have an incredible collection of dining sets in a variety of styles, sizes and finishes to fit your lifestyle and home. Come browse our collection, and save 20% off mid-century vintage dining sets through November 18! 2. Decide on a style. Consider what feelings you want to evoke and what will best flow with your dining table and interior design. Would a rustic table setting hit the mark, or do you want something more modern or elegant? 3. Choose your colors and textures. Decide on a main color for your display, as well as 1-2 accent colors. We love using a neutral color, such as white or ivory, as the main color and adding in pops of black and copper or rust for a palette that works with any style. And don’t be afraid to play with texture! Combine textures and materials to add interest to your Thanksgiving table design. We love mixing copper, linens and rustic woods with crystal glassware. Varying your textures and colors adds depth, warmth and interest! 4. Add a special touch to each place setting. Whether it’s a mini pumpkin or a handcrafted name card, be creative in how to dress up your dinnerware. Fun tip: Spray maple or oak leaves with gold paint, then write names in with a permanent marker or paint pen. 5. Be mindful of centerpieces. There’s nothing worse than trying to have a conversation when your view is blocked by a candelabra or giant flower display! Remember that the best part of the gathering is connecting with those you love. Keep centerpieces low (such as groupings of small candles or pumpkins) and leave the taper candles for other areas of your home, or for in-between place settings where they will not block your guests. 6. Bring the outdoors in. A touch of nature always inspires festive feelings and adds warmth to your Thanksgiving display. Fill in your table setting with dried oak and maple leaves, twigs and pine cones for a simple and beautiful touch. 7. Set the table the night before your gathering. Rushing around at the last minute creates chaos and stress, when you should be enjoying your loved ones as they arrive! Staging your table the evening before allows you plenty of time to play with options and reconfigure as needed until you arrive at the perfect table setting. Besides, you’ll be busy in the kitchen on Thanksgiivng Day! Hosting guests for the holidays? Come browse our dining sets that will make every gathering more memorable. To fun and stylish bench seating… we have something perfect for every home gathering! And, of course… we have chairs in a variety of gorgeous styles to finish off the look. Come visit our showroom to try out all our dining options and let us find the one that’s perfect for your lifestyle. Save the Date for our First Friday Artist Open House! In conjunction with the First Friday Art Walk here in Portland's Central Eastside, Legacy Modern would love for you to come join us for our First Friday Artist Open House. Enjoy awesome, high-quality local art, food and drinks. Come meet some of Portland's finest artisans, listen to some sweet tunes and have a joyous time. Bring the whole family! We’re also proud to feature Smitty’s Freshly Roasted Coffee during the event. We love this small batch craft roasting company and their dedication to the “Fresh Coffee Experience”. Come experience it for yourself! Our Open House is also a great chance to browse our fall dining collections before those holiday gatherings arrive, as well as to explore our neighborhood and all the awesome businesses participating in the #FirstFridayArtWalk. Find more info on our Facebook event page. Come browse our incredible collection of local art, like this gorgeous piece from Tappen Studios.